The “open educational ideas and innovations (OEI2)” initiative promoted open collaboration already when ideas for OER development are being formed so that trust into the educational materials gets higher and existing resources are more likely to be re-used. Now at the end of our project, we are excited to share good practices that demonstrate such an apporach. On this page you will read how B.A. students’ research for and with companies became more collaborative, efficient and better guided when their supervisor opted for the online platform “Idea Space” as a central work tool. Baden-Württemberg Cooperative State University (DHBW, Duale Hochschule Baden-Württemberg) is professional higher education institution with strong ties to companies. At DHBW each semester is divided into two phases: Learners attend lectures and seminars at the university and spend practice phases at a private company or in the public sector. Furthermore, the cooperation partner from industry offers research questions and fields for final theses. By engaging company members and exploring real work scenarios in business, working on their thesis students means researching the challenges they are expected to face in the world of world. For a thoughtful analysis effective collaboration is needed among the student, her supervisor/other academics and the company managers/experts. Instead of being limited to occasional meetings in order to discuss the goals of the research, methodology and results, some B.A. students in the programme “International Business” at DHBW deployed the online platform “Idea Space” to co-create within a multidisciplinary team. This group provided continuous research know-how, methodologies and support to the student throughout the different research processes. B.A. students, B.A. supervisors as well as other academic experts at DHBW and a team of business/company experts at universities cooperation partners. The co-creation through the online portal transformed how research goals and processes are defined by both young and established researcher and associated industry partners. The practice overcomes a lack of disclosing research methodologies and results among other academics and industry and further tightens the ties between the world of work and professional higher education. It provides a good example how to open up in that sector of higher education. Opening up the research approach helped to address challenges that students typically face in their industry-related research work, such as limited or even insufficient information from the companies, acting under ambiguous circumstances or in complex economic and political contexts. Initiation: The B.A. 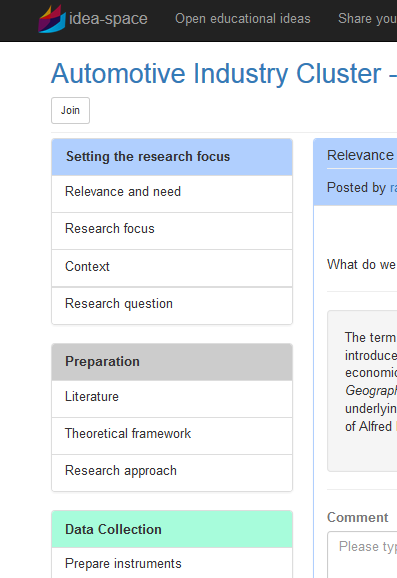 thesis supervisor provided a structure for the research topics on the Idea Space platform by further customizing the template “Open Research”. Industry and peer involvement: The supervisor initiated the online collaboration among the B.A. student and the manager in the industry. The idea was also shared with professors at other universities running industry-related research projects with their students that result in research papers for bachelor theses. Two more professors joined the collaboration and new ideas and resources were initiated on the Idea Space platform. Collaborators provided input on the research theme. Resource sharing: The different collaborators gathered resources, information and literature and discussed constraints. Conducting the research: Students developed the research methodology and gathered data for or within the companies in order to achieve all research project goals. Improvement ideas and validation: Feedback was collected through the idea space from associated professors and/or researchers. The theses and publication was validated by the B.A. supervisor and company managers. The primary challenge of the research projects was to agree on a methodology and means for quantitative analyses. The secondary — and more ambitious — challenge was to find collaborators to contribute their input that can be integrated to meet pre-defined research objectives. As a result of the co-creation process several DHBW academics recommended some existing OER as well as other learning materials which are now used in classes in the following years and will be further improved. Furthermore, some students and academics agreed to continue to work together on other research topics and projects in class, i.e. team building/networking was strengthened. The company representatives supported the research team to different degrees. A main driver of their contributions was the committment of the B.A. supervisor regarding an open collaboration on the Idea Space platform. The working method and tools used were acknowledged by further collaborators. Students and researchers perceived that open collaboration on the idea space platform improved knowledge generation and transfer. It also provided more clarity on the different perspectives from academics and industry. Furthermore, openly sharing the research effort and collaboration opportunities in the “Idea Space” engaged entire courses and significantly decreased the development effort of B.A. projects and research work of students (also for term papers).